In my home, sunny work free Sundays spell adventure day. Spontaneous as they are, unspoken rules forged over thirty plus years of marriage hold them in place. Content to let my husband choose our destination is pivotal. He drives, I sit back and take it in – the element of surprise far out weighs inclusion in our destination. Eighty kilometers out of Vancouver we exit the highway at Chilliwack, knowing in my heart a half hour diversion to walk a few blocks of classic car show has nothing to do with our destination. 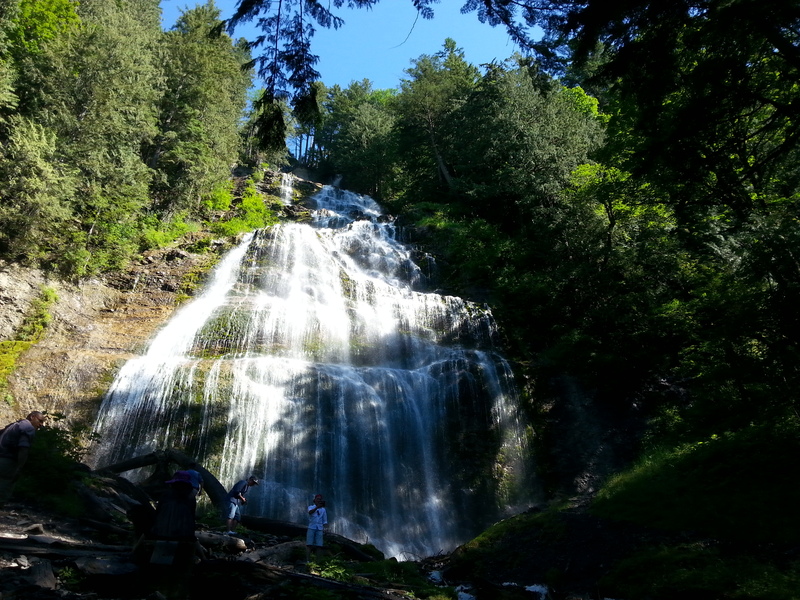 Back at the car, he spills the beans, “we’re going to Bridal Falls” – setting true adventure day in motion. Aside from spontaneous origin and vague destination, adventure parameters are strict – avoid main highways, absolutely no fast food, stop as often as we like. Yale Road meandered past corn, raspberry and blueberry fields, dotted with dairy farms and a RCMP vehicle guarding the demise of a road kill deer. Stopping at a garden shop netted an Echinecia plant. A kilometer or so down the road, a field of chickens found us circling back for a closer look. In all my life, despite rumors of free range chickens, I’ve never seen anything like it. 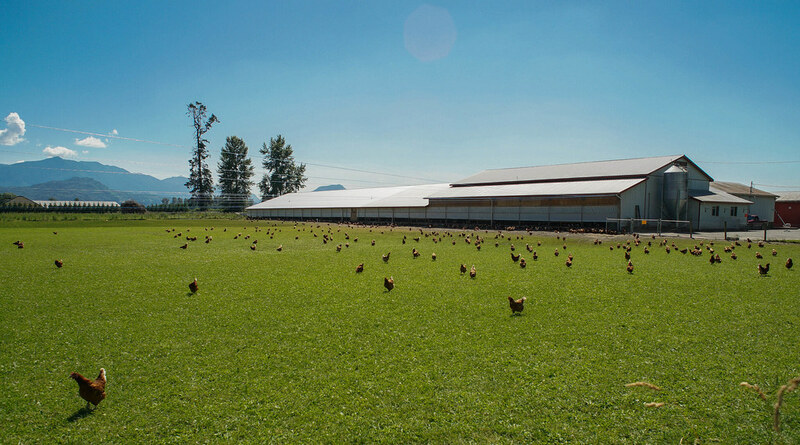 Hundreds, likely thousands of happy chickens roaming the greenest of fields. Without exception, every last one the County Fair blue ribbon epitome of poultry perfection. Snapping photos from afar, we heard a neighbour across the street call out “do you know how many people stop and take pictures of these chickens?” A brief exchange of pleasantries revealed eggs were for sale, “they’re really good, just go knock on the door”. Moments later we’re knocking, dog is yapping and Harvey calls out from an upstairs window “I’ll be right down”. 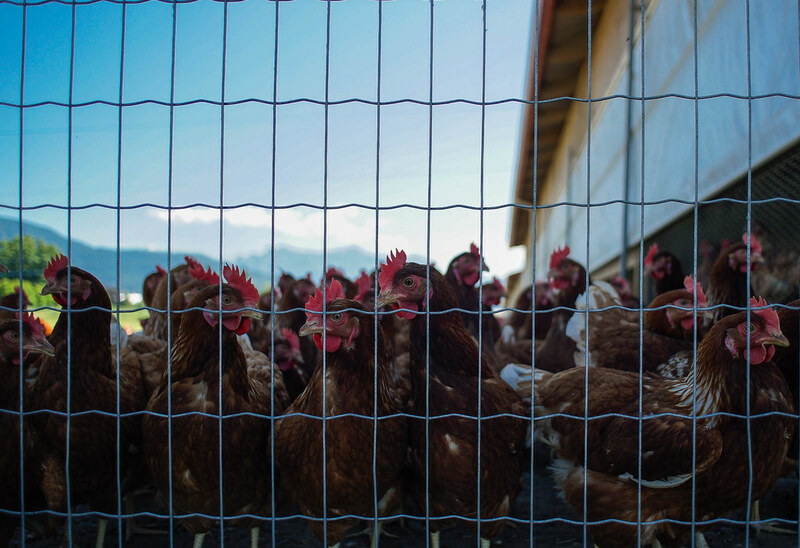 Harvey’s hens are certified organic – we buy 2 flats of 30 for $25. Sixty eggs! No worries, they’re delicious. A few kilometers later we cross the highway at Bridal Falls. “It has to be over 20 years since we stopped here, how old were the kids, do you remember this steep hike?”.